Calgary native Trevor “Rove” Jameus has been creating art his whole life, starting out as a young boy with a keen interest in comic style illustration. At the drawing desk is where he spent most of his days trying to perfect his artistic skills. Armed with immaculate attention to detail and superior visual storytelling abilities, he soon became a fixture in the local comic book world. His illustrations can be seen in various comic books including Legend of Isis (Alias), Decoy (Penny Farthing Press), Ezra (Arcana) and his most recent work, an original web comic titled Terminals (Penny Farthing Press). Terminals was a three year long labour of love, created by Rove and his partner-in-crime, Ryan Ferrier. (www.terminalscomic.com) Rove is also a yearly staple at the Calgary Comic and Entertainment Expo as an invited guest since its inception in 2006. You will find him there year after year selling art prints, drawing superhero commissions and promoting Ascending Koi to the masses. With some formal training at ACAD, Rove learned to become a “jack of all trades” artist. In addition to illustration, Rove excels in many other art forms including ink, watercolor, and graphic design. Over the years his work has ranged from painting & portrait commissions to oil & gas illustration to graphic design and everything in between. Somewhere along the road a friend suggested tattooing. After some thought, Rove started an apprenticeship and quickly realized he had discovered an art form that rivaled his passion for illustration. Finding a career that married his creative skills, love of art and goofy personality made tattooing an easy choice. 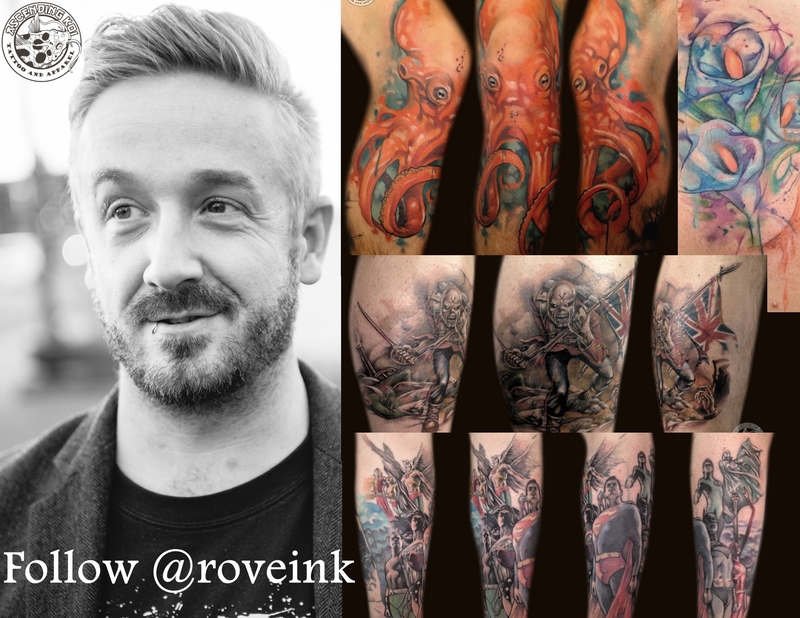 Rove has been tattooing for over 7 years now, claiming his stake in the world of permanent body art while constantly learning and drawing inspiration from Ascending Koi’s talented family! 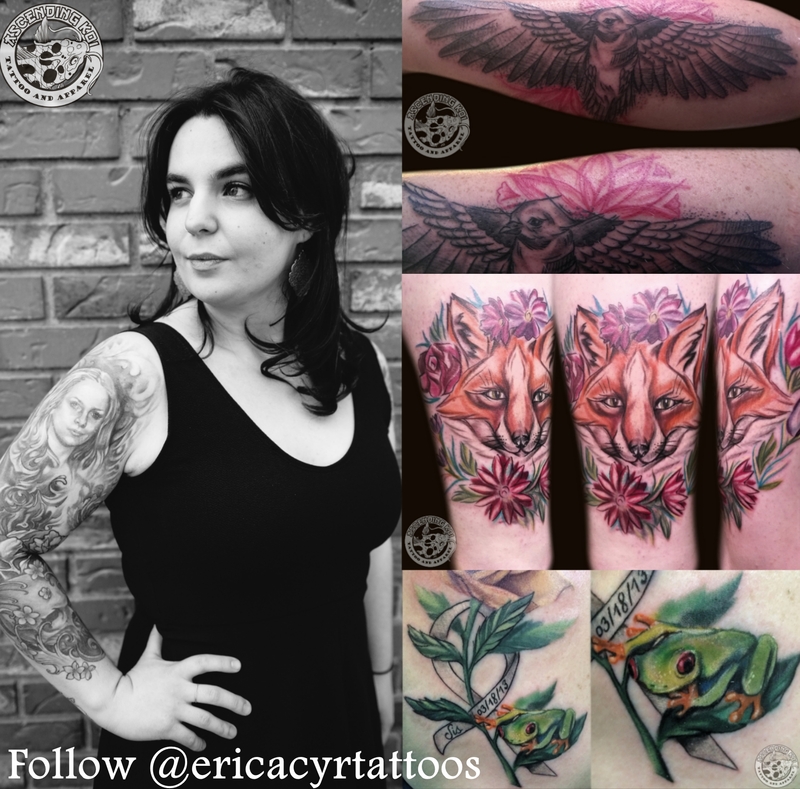 Erica has been an artist and art lover since she was a child that roamed Montreal museums with her mother. Erica is honing her artistry influenced by her love of illustrative art, low-brow art, etchings, ink, and water colour. 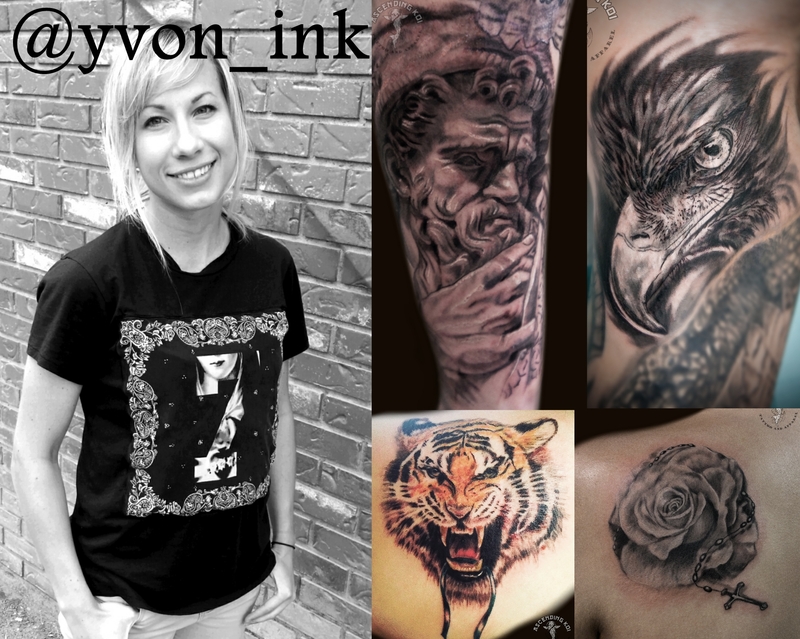 Inspired by fine art, film and music, she feels privileged to work with so many creative talents with her fellow tattooists. Albert Einstein’s words, “Few are those who see with their own eyes and feel with their own hearts”, illustrates Erica’s blessing of her love of art actualized in creative talent with a passion to share that with others. Rob draws much of his inspiration from his skateboarding/urban art background. With some formal training at ACAD and NICAD, he is able to mix real art concepts with an awesomeness not usually seen in tattoo art. Rob is a devoted family man with a longstanding love for cartoons which keeps him young at heart, easy going, and not too serious. 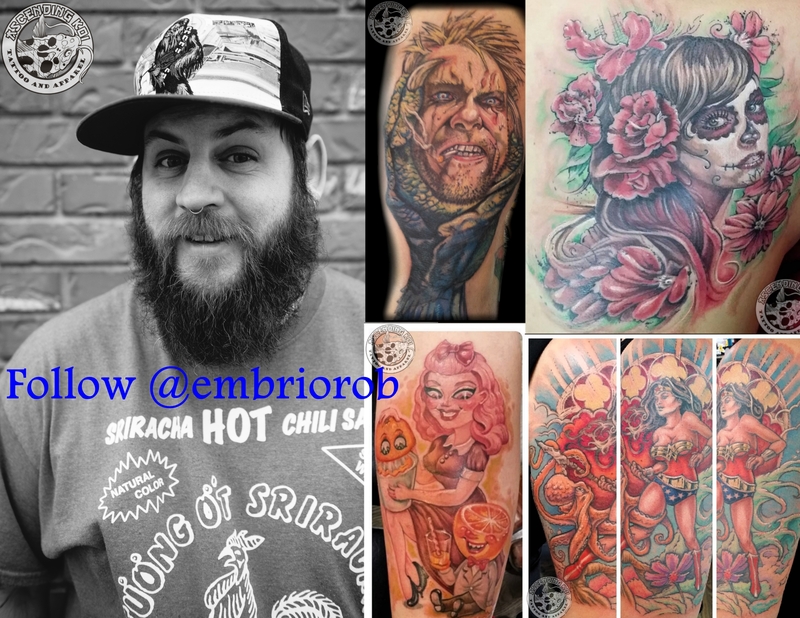 Rob looks forward to executing all tattoo styles, and is continually honing his craft. He enjoys the creative atmosphere and mutual support Ascending Koi. At a young age I knew I was going to be an artist. Throughout my life, I have redefined the word “artist” in my head a million times over. That may be the most exciting part for me. Tattooing happened randomly; I never really planned it. I studied new media at the University of Lethbridge. Design, photography, and sculpture at the Edinburgh College of Art, and also at the Alberta College of Art and Design. It was, in a way, a five-year detour and education that led to my understanding of drawing, color theory, composition, lighting, and most of all thinking like an artist that I now draw upon every day in my career as a tattoo artist! Although I do a variety of different styles of tattoo, I am most interested in realism and Japanese mythology. I love the beauty and connection of realism, and the meaning and legends behind Japanese tattoo. I hope to put my own style on both forms and achieve an artistic expression that is both visually interesting and unique. I enjoy the collaborative process of tattoo and being able to help tell a person’s story through the artwork I put on their body. I feel the tattoo is a success when I have achieved a piece of art that has exceeded that person’s expectations. For me, choosing a career in art is choosing a career of constant learning. I am forever grateful for everyone who has been tattooed by me and for anyone who chooses to be tattooed by me in the future.